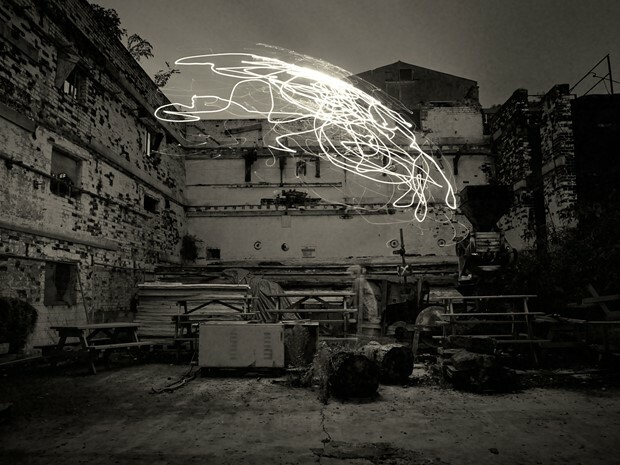 Working with specially constructed drawing tools in the dark of night I engage with natural elements including the sea and the wind to map out spaces and environments, tapping into the natural energies to trace and draw, and document unique, live, site specific performances. The reality of the captured image is fundamental to all my work, particularly with long exposure photography, or space-time. The concept of time is crucial to my ideas, exchanging the classic definition of photography as a series of instant glimpses of the world in which we live, to a personal definition of ‘space-time’. 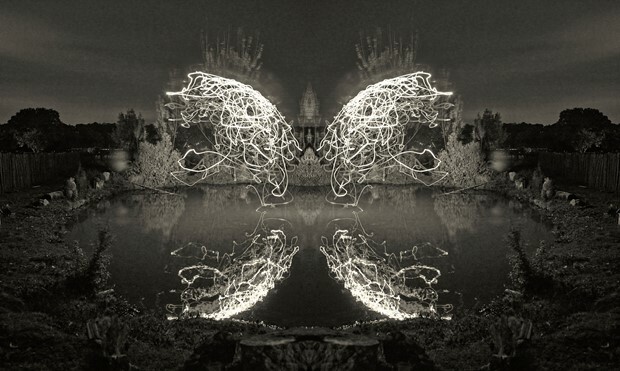 Through performance and space-time photography I map natural spaces and man made environments. Interactions with natural elements such as the wind or the tides, are intrinsic to my process as I document my live performances over an extended period of time producing one still photograph. John Cage talked about the accident or mistake in creating art. Through careful, technical planning, predetermination or pre visualisation, I own the accident; it is very much a part of what I do. 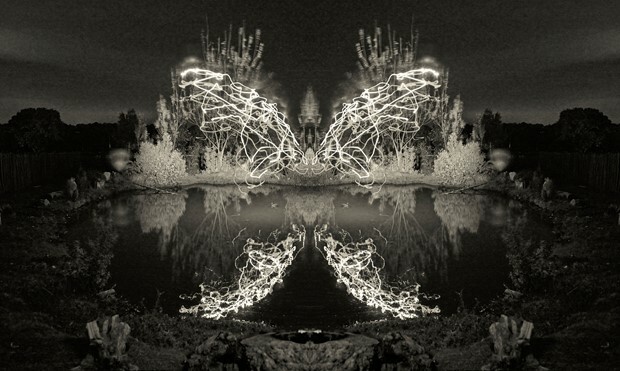 Working on location at night, I create ?a field of vision for the light drawings to take place; the outcome is unknown. The photograph is the evidence of an 'event' that has taken place, a 'performance' that even I myself cannot see in its entirety. During creation, only ?the process is evident. It’s through the inherent values in photography as a documentary process that I realise the idea. A conceptualist arts education in the early 70's at Coventry School Of Art continues to inform my thinking and work practice. Drawing or mark making in its widest interpretation is integral to my work. The mark, as an engineering drawing or a mathematical notation, is the beginning of the journey to new ideas. As a young art student, I was influenced by Pollock's approach to random mark making and the artist's’ intervention in that process. I create stages for these interventions to unfold; with the knowledge of these stages in daylight, the 'performance' is transformed by night. In 1986 I transitioned from photography and ventured into cyberspace, initially experimenting with early digital formats, combining them with analogue photography. Through this period major electronic mapping works included ‘Iconoclast’ and ‘The Journey of The Skin Man’. These were later used to illustrate the current concerns about photography at a symposium at The National Museum of Photography, Film and Television in 1991. The print and publishing industry viewed digital as either a threat to or an opportunity for the creative industries. I fully embraced the changing tides and spent the next 20 years exploring ideas in the new technologies, producing multimedia installations in both physical and cyber spaces. I have won many international awards for my work in recent years and was the first photographer to receive three RPS International Print Awards. My work has been shown in the UK and worldwide including The National Portrait Gallery; The Photographers Gallery, London; The Brno Museum, Prague and the Museum Of Contemporary Arts in Argentina. My work is also in many private and public collections. I live and work in my studio / farm near the coast of Suffolk, East Anglia and central London. 1998 'Emissions' Milverton Gallery Leamington Spa. 2008 LIP 20th Annual Exhibition Selected by Clare Grafik and Paul Hill Atrium Gallery London. 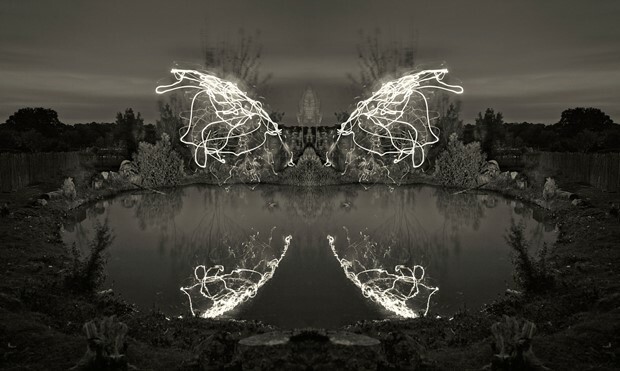 Work in many private and public collections including Allen and Overy London, Coventry Canal Basin Arts Trust, Centre For Fine Art Photography Colorado, Caroline Wiseman South Lookout Tower Archive. 2009 The Brilliance of Photography RPS Symposium on Contemporary Photography. Speakers include : Gerry Badger, Paul Hill, Steven Gill, Bill Jackson, John Blakemore, Peter Kennard, Daniel Meadows, Richard Sadler. 1992 'Independent Film and Video Festival' Co Organiser at Robins Cinema Leamington Spa for Art on the Move Festival. Photographic works shown at various conferences and seminars on contemporary practice including the ICA London, Sheffield Media Show, The National Museum of Film and Photography in Bradford.